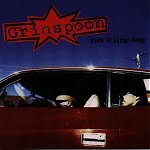 Heavy metal Australian style, this four-piece from down under, known as Grinspoon, can pack fierce notes, screams, and some caged rage meets melody into a volatile package that will run you over like a diesel locomotive if you're not careful. On their debut full-length for Universal Records they rip through fifteen tracks of aggressive metal sure to split some heads. The guitars soar on "Post EnebriatedAnxiety" while the rhythm section anxiously beat to death their instruments for the hardest, purest sound they can generate. But, in between the screams and the bone crunching sounds, they still find time to put in a melodic drive that lifts their songs above that of 'metal' and into a whole new category that could be described as a cross between many genres, or a sound their own. Will stick with the second one for simplicity, though. These guys never give up either. "Black Friday," "Pressure Tested," "Pedestrian," and "Boundary" all capture the same loud, abrasive, and angry sound of the opener. Never tiring, or losing sight of their drive and focus, the band keeps the mentality high and the volume even higher as they down power like it was beer. If you thought their EP for Universal was fast, loud, and ready to break things, then the next step should shock you even more. One part melody and nine parts aggressive, adrenaline-driven behavior, watch the anger fly as they rip through your stereo. I'll give the album a B.